Well hello there! 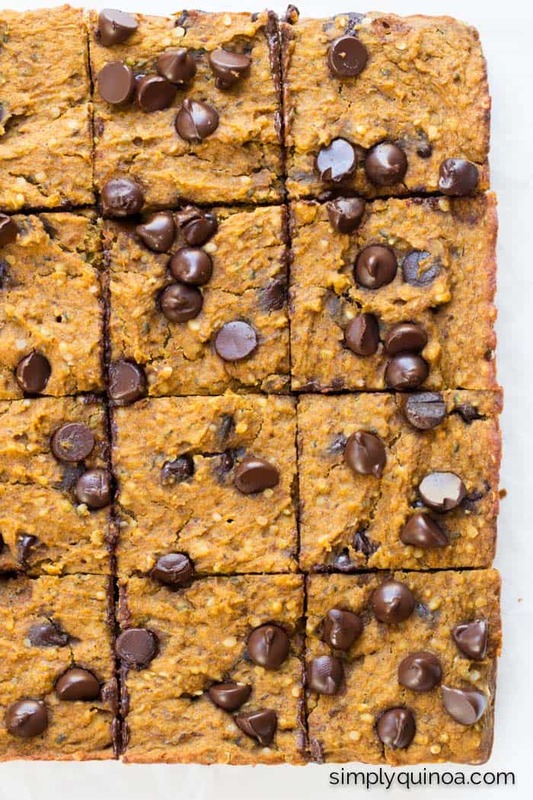 Does anyone else spy a little orange tint to those quinoa bars? Oh yes my friends, it's happening. Pumpkin. And chocolate. And quinoa. All wrapped up into one little square of deliciousness. You aren't going to believe me when I tell you about these bars. They're sort of a crazy jumbling of ingredients and my goodness they are good. Like realllllly good. So good in fact, that I've had to give part of the latest batch away because I'm finding myself sitting on the couch and eating like four at a time. Although they do taste super bueno and, despite their decadent look, they're actually healthy too. I know it's probably a little early for pumpkin season, but I just couldn't help myself. 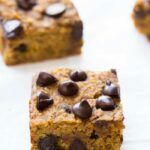 After your response to the peanut butter bars and the blueberry breakfast bars I made a few weeks ago, I've been dreaming up fun new ways to add quinoa to bars. Why? Because since so many of you are busy busy, bars are a great option when you need something quick and healthy while you're on the go. These? They're no exception. And even though they are studded with dark chocolate chips, you're going to love all the goodness that's happening inside. Pumpkin: not only is pumpkin one of the greatest flavors ever, but it's also got lots of nutritional benefits that work for us. 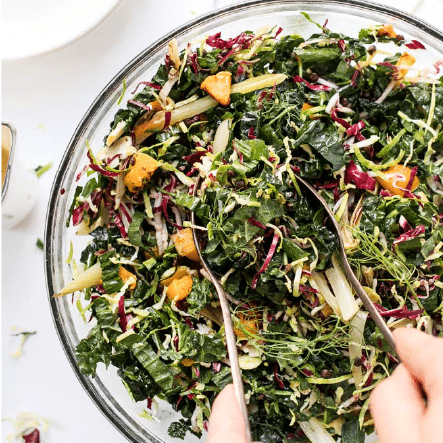 Pumpkin is packed with fiber, is high in vitamin A, has lots of beta-carotene (gimme all the orange veggies!) AND is super high in potassium. Plus, it's relatively low in calories and can be a great addition to baked goods (like these👆🏻👆🏻) to replace some fat and add some moisture. Banana: oh how I adore banana 🍌🍌 and if you haven't already noticed, I'm kind of obsessed with adding it to my baked goods. Banana is high in natural sugars which makes it perfect for adding to things like this because it amps up the sweetness without the need for tons of additional sugar. Bananas are also high in fiber, potassium, vitamin B6 and vitamin C.
Flax: we use flax a lot around here as an egg replacer, but flaxseed meal is also a really amazing ingredient. Flax seeds are one of the highest plant-based sources of omega-3 fatty acids which support heart health, regulate circulation and support proper kidney function.⭐⭐ Flax is also high in both soluble and insoluble fiber, and is super easy on the digestive tract. And while all those ingredients are simply amazing, I've got one more surprise in store for you. Unlike my blondies or peanut butter bars, the base of this sweet treat isn't a nut butter. In fact, there's hardly any fat in these at all. Say whaaa? I know it sounds insane. But it's pretty amazing too. Granted, this isn't a new idea. 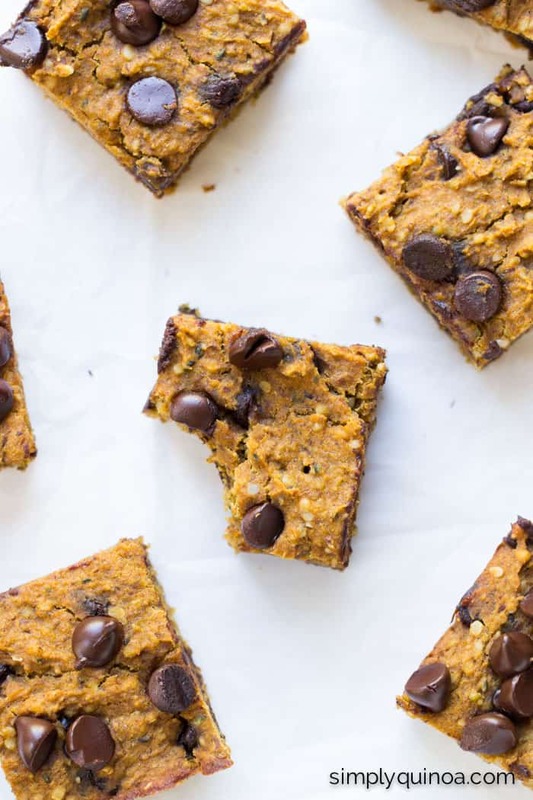 There's lots of recipes out there for chickpea blondies, but this is my first time dabbling in the chickpea-inside-of-baked-goods world and yes, while I was also a little skeptical at first, I think you're going to be amazed at how tasty these are. Let's think of them like a different version of black bean brownies, which definitely have become a “thing” in the last few years. 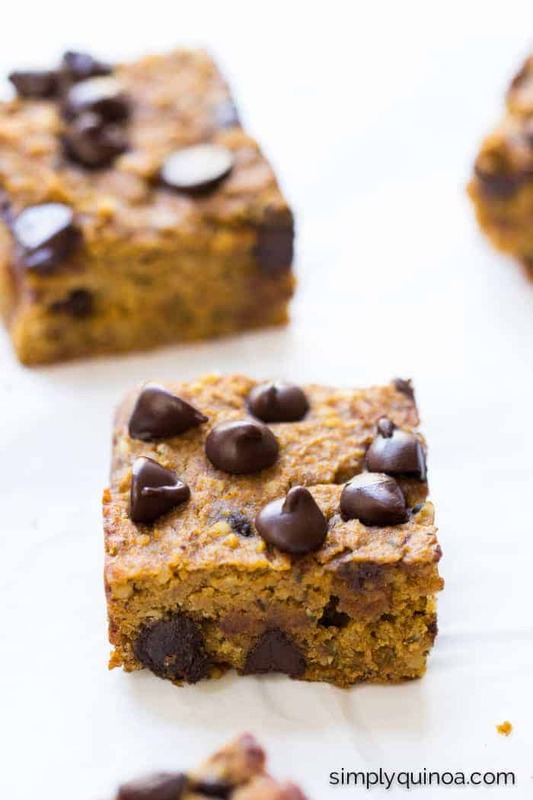 Adding chickpeas to your bars is basically the same thing, but I almost think better because they let you play around with your other ingredients more. Black beans? They need chocolate. Chickpeas? You can go in whichever direction your heart takes you! 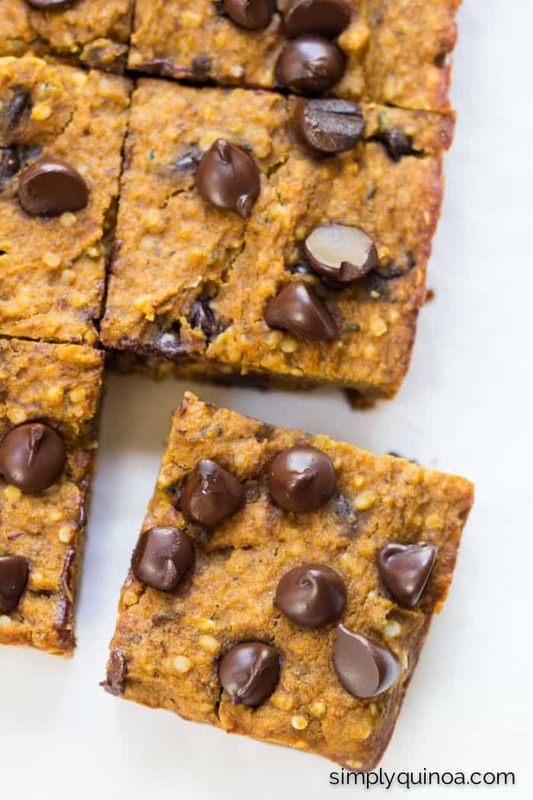 Plus, they really amp up the protein of these quinoa bars. So there's that going for them too. 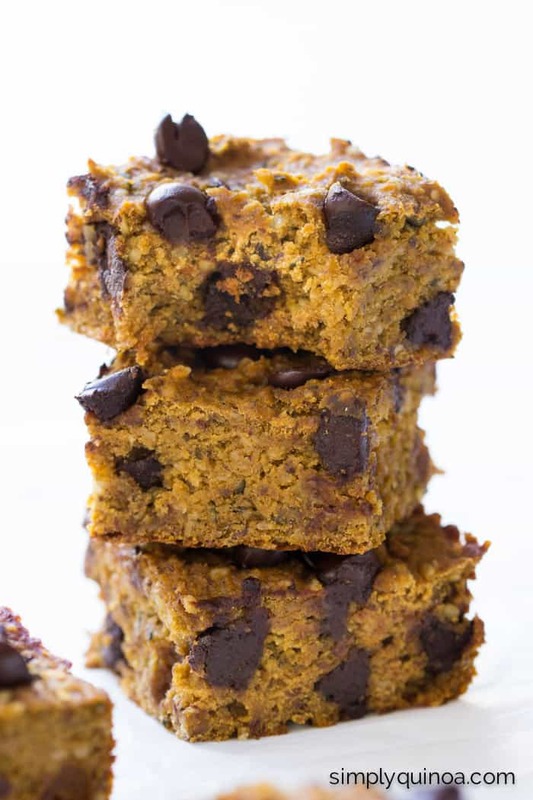 We've got: quinoa, pumpkin, banana, flax, hemp and chickpeas (plus coconut sugar, spices and chocolate chips). What we don't see: gluten, dairy, oil, refined sugar, eggs, or nuts. Ummm hello. These bars are perfect. And if it was me…these beauties are TOTALLY breakfast worthy. Woo hoo! Meanwhile, blend the chickpeas, banana and pumpkin in a food processor until completely smooth. In a large mixing bowl, whisk together the dry ingredients, reserving the hemp hearts and chocolate chips. Pour the chickpea-pumpkin mixture into the bowl along with the flax egg and mix to combine. Fold in the hemp hearts and chocolate chips. Let cool in the pan for 10 - 15 minutes, then transfer to a wire rack and cool completely before slicing. If you can't find vanilla powder, substitute 1 teaspoon of vanilla extract and add the vanilla to the food processor while blending the wet ingredients. Would chickpea flour work in place of quinoa flour? I have a food sensitivity to flaxseed and eggs. How would you make an egg substitute if not using the flax version? mashed banana? Mashed banana or chia seeds! 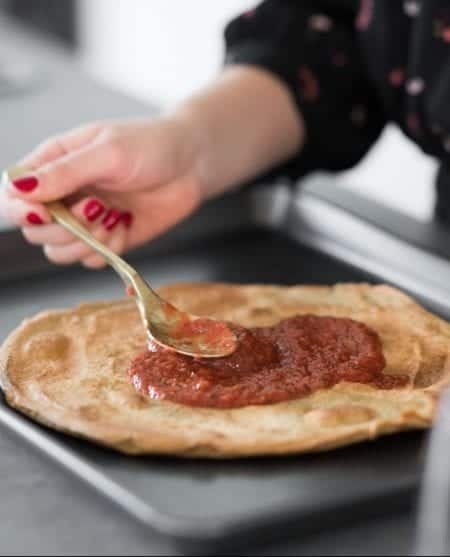 Hi there – these look fabulous and ours are in the oven baking right now! Wondering if you have a nutritional information anywhere on these beauties? sounds good – one thing I do know, cooking or heat of any kind with flax destroys its most important benefits. I usually grind and use fresh in salads. 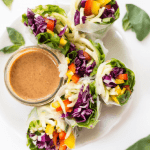 I am going to try this recipe – as I am trying to go plant based for life. I haven’t tested it with anything other than quinoa flour, but you could try another flour and see how it works! My dish is in the oven now. 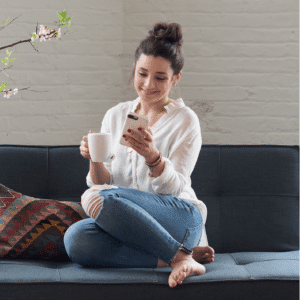 Wondering why garbanzo beans? seemed a little chunky in the batter as i sampled it. Navy beans may be smoother? I’ll have to experiment! Thanks for sharing! How did they turn out? I didn’t find mine to be chunky at all – perhaps you didn’t blend them long enough? Definitely think navy beans could work, but they would be a little more watery, so you might want to adjust other ingredients (or baking time) accordingly! They were FABULOUS! I had a few chunks here and there but nothing to be upset over. Probably my terribly food processor! I loved this recipe and have it saved for future use! First time using the toasted quiona you recommended doing. Not bitter at all! Thanks!!!! Thanks, Lynn! Great to have you here 🙂 The chickpeas are measured after they are cooked. If you’re using canned it’s about 1/2 a can. I’m not sure what it would be if you were starting with uncooked beans. Let me know how they turn out! OMG these look so good and I would not have thought they had chickpeas in them. I want to try these for the kids who are picky eaters. Oh, you had me right up until chickpeas (I”m allergic.. I know, right?!) I usually sub navy beans in every other recipe.. do you think they would work ok in this? I think it would work, yes! But I haven’t tried it so I can’t guarantee it 😉 Let me know if you try! You’ll need to cook them. I usually soak them overnight, rinse, and then cook. To cook cover with water by a few inches, bring to a boil and then simmer until done (60-90 min for me usually but you’ll have to test as you go). 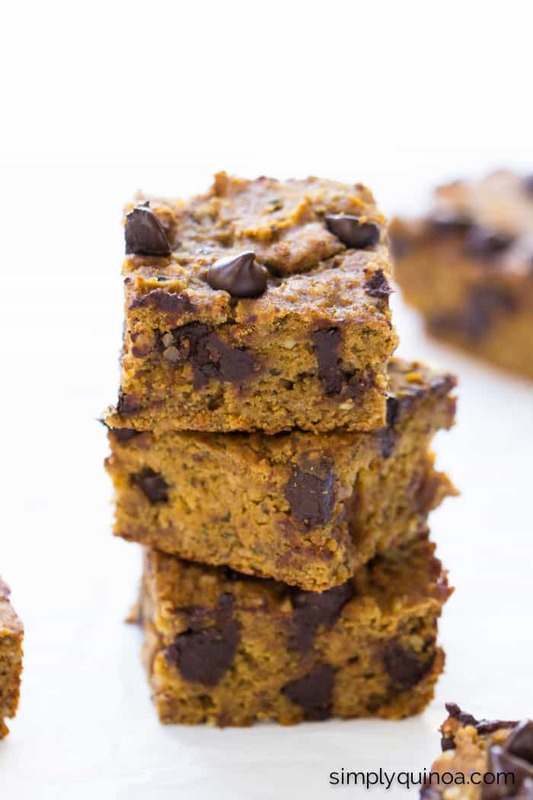 I just made these, because pumpkin season. And I really, really like them! I had slightly not enough banana, so I increased the pumpkin to make up for it, and I also halved the sugar (and also used cane sugar since I don’t have coconut) and found them perfectly sweet. What can I use as a substitute for the hemp hearts? Feel free to add some cooked quinoa or 2 tablespoons of chia seeds! You could absolutely try, but I’m not sure that it would work since applesauce isn’t as sticky as bananas and the bananas really help hold the mixture together. 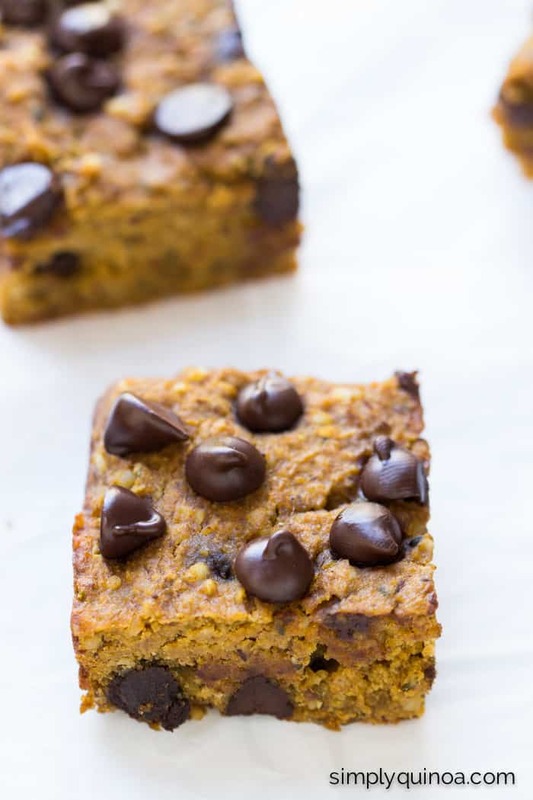 I think what I would try if I was replacing the bananas, was to increase the pumpkin by 1/4 cup, add 1/4 cup more sugar and add an extra flax egg. If it seems too wet, then I’d add a tablespoon or two of quinoa flour.